Crochet purses are hip, practical and offer a unique spin on a traditional bag. Like shoes, purses come in all shapes and sizes. There are larger ones that will carry everything from books and extra clothes, as well as smaller purses used for a night out on the town. Purses can have long straps or small handles and zippers or snap fasteners. Any type of purse you can imagine can be crocheted, including this cute sling bag that can be made in any colors you like. 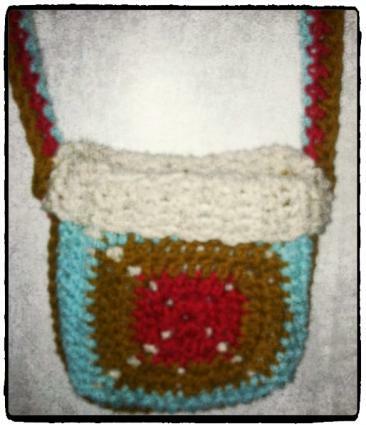 This shoulder bag is made by crocheting two granny squares together, then adding a liner and a handle. This pouch is very easy to make and an intermediate crocheter could finish it in a few hours. The finished product is very handy for a phone case, wallet pouch, or even a crochet hook holder. To use the pattern, click on the image or the link below it. The PDF file will open in a new tab or window, and from there you can download it to your computer or print it out. 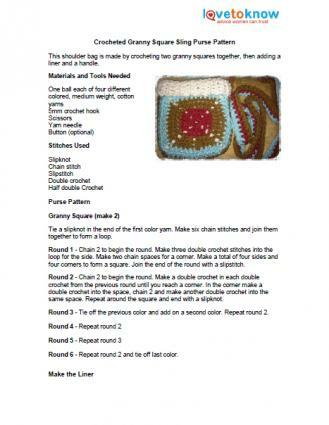 If you need help downloading the pattern, check out these helpful tips. Sew a button to the top of the pouch and add a loop for closure if you want a more secure pouch. Use this pouch as a pocket for a larger bag. Simply do not add a handle and just sew the pouch to another bag. Make a larger pouch by adding a few more rows to the granny square and 2 rows to the liner for every row you increase in the square. Make the handle shorter or longer according to your needs. There are a number of additional free patterns online to find a style that you like. Little Heart Purse: What little girl would not live this red, white and blue purse? It's perfect to take along on a Fourth of July picnic! Midnight Jewels Bag: This fun bag is perfect for your cell phone, lipstick and keys. Stained Glass Orchid Crochet Purse: If you are looking for a classy crochet shoulder strap bag, this is a great choice. Remember to read each crochet pattern all the way through before you begin your project. If you want to alter the bag in any way, write down your changes prior to crocheting. Be sure you are familiar with all the stitches used; practice if you need to, it will save time in the end.